Every year in early autumn in the Alps animals that have spent the summer grazing in high pastures are brought down to the valleys for the winter. 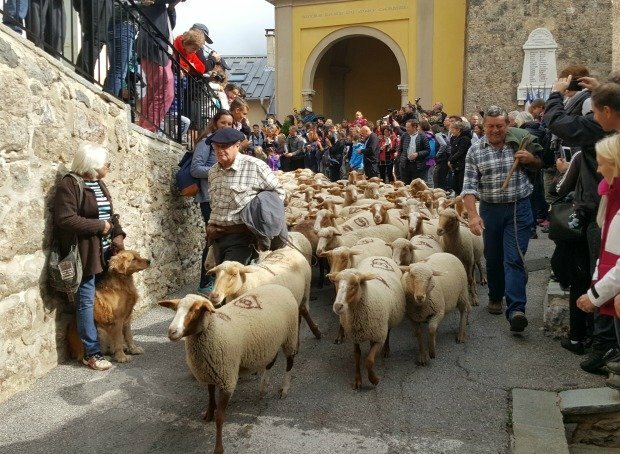 This movement of livestock is called transhumance and in many villages it’s the perfect opportunity to get together and celebrate; a great excuse for a fête. 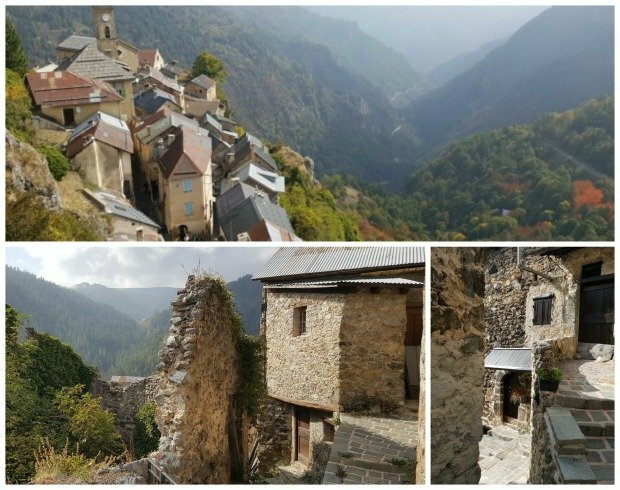 A couple of weeks ago, with a less than inspiring weather forecast and only a few hours available, we decided on the spur of the moment to go and experience a transhumance for ourselves in a gorgeous little hill-top village. 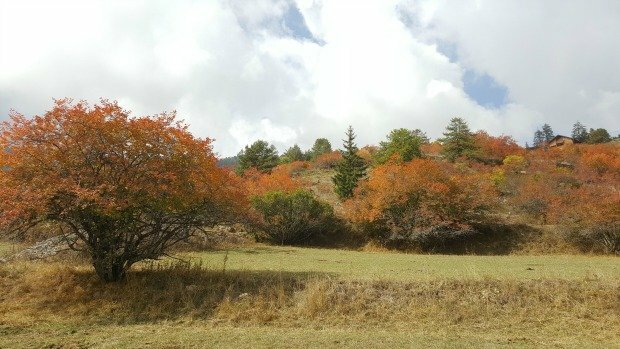 We loaded up the car with rain gear and warm fleeces as we would be at about 1500m altitude, it was October and rain was expected. The heavens were supposed to open on us just as the fête was due to start but don’t you just love it when the forecasters get it completely wrong, in your favour? By lugging around winter clothes, we seemed to be guaranteed sun and warmth, perfectly lighting the exquisite autumn colours in the forests around. 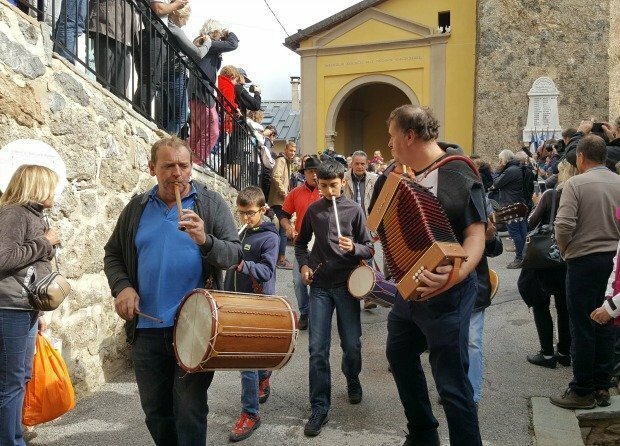 The fête de la transhumance we went to was in Roubion, a medieval perched village about 90 minutes (scenic) drive from home. Although we’d been to the village a few years ago, we’d only been to the small ski resort a couple of kilometres from the old centre and we hadn’t actually explored the village itself. 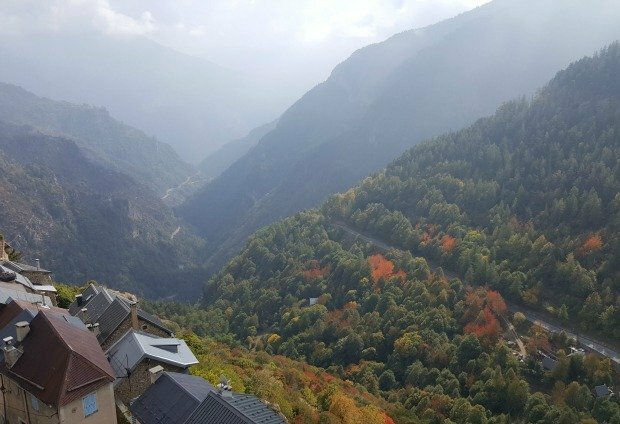 I remembered a hairy narrow road and some precarious houses clinging to the cliff, and a wonderful Auberge on the ski slopes, that was about it. Well, suffice it to say the road is still very “hairy” though we’re much more experienced driving on these alarming narrow mountain roads now than we were back then, and the village really is perched. It’s almost vertical and it needs to be added to my list of top hill villages to visit near Nice, it’s tiny and full of charm. We arrived in Roubion at the end of the morning and by the time we’d parked and walked into the centre the four communal was just selling its last loaf of bread! As part of the festivities the traditional communal bread oven, no longer in regular use, was baking loaves but we missed out by seconds! Not to matter, we went in search of the best viewing point for the arrival of the sheep, passing a traditional Provencal band playing pipes and drums, and before long the action got going. Preceded by the musicians and a couple of shepherds about 2000 sheep herded through the narrow alleyways of the village. Sheep being sheep, they pushed and shoved and bleated along in a tight flock, looking bewildered and getting faster and faster as they squashed along. TV cameramen bustled along with them filming for the local news and then it was over. As quickly as they’d arrived, the sheep had moved on, leaving a trail of little round poos in their wake. The idea then was to follow the flock to the ski area about 2 kilometres away where entertainment was provided including sheepdog displays and food stalls. Unfortunately though we were short of time, having to get back to do a check-out and changeover in the gite before new guests arrived in the early evening, so we couldn’t continue along with the sheep. As the sun was out we grabbed some sandwiches and decided to climb up to the top of the village for lunch before heading back to the car. Over the years we’ve visited many hill villages in the Alpes-Maritimes but never tire of exploring more, as each one has its own character. Roubion, as I mentioned before, is practically vertical, with steep narrow paths leading up and down in the most higgledy-pickledy fashion I’ve ever seen. My bilingual Frenchy husband and kid learnt a new word (expression?) that day… I’m not sure if I’d ever used it before, but it struck me that it was exactly the right way to describe the village. Paths led up and down wherever you looked, almost Escher-like, a reference my 12 year old understood having visited the M.C.Escher museum in The Hague during the summer! Houses in these hill top villages are often decked with flowers and succulents, growing out of the tiniest places, but this time we were charmed by an unusual feature that we’d not seen before – many buildings had naïve paintings of traditional country, mountain and village scenes on the doors, walls and shutters. 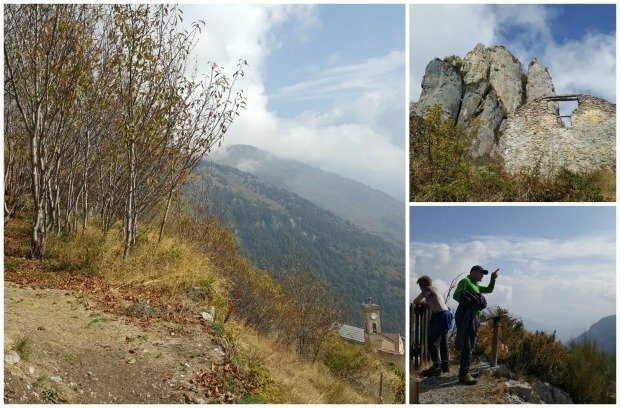 We climbed up past a curiously laid-out painted chapel and several ruined buildings under an impressive rocky outcrop, high above the village to be greeted with glorious sweeping views of the mountains and valleys dotted with flamboyant autumn colours – some of the best I’ve seen in this area. Loaded as we were with winter clothes we boiled in the hot sun and gulped down icy mountain water from the many fountains, for what we didn’t have with us was anything to drink (having believed that hopeless weather forecast!) Sandwiches finished, we scrambled back down to the car and drove home. All in all we were out for about five hours – five hours of a complete change of scenery, in the mountains, surrounded by rich reds and yellows of autumn, and of course, the silly sheep. And yet the following weekend we were back on the beach, basking in the blues of the Côte d’Azur. How can anyone fail to love this part of the world? 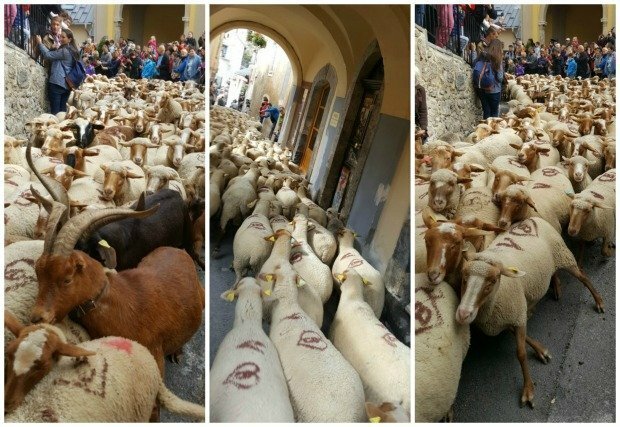 Have you ever been to a transhumance? 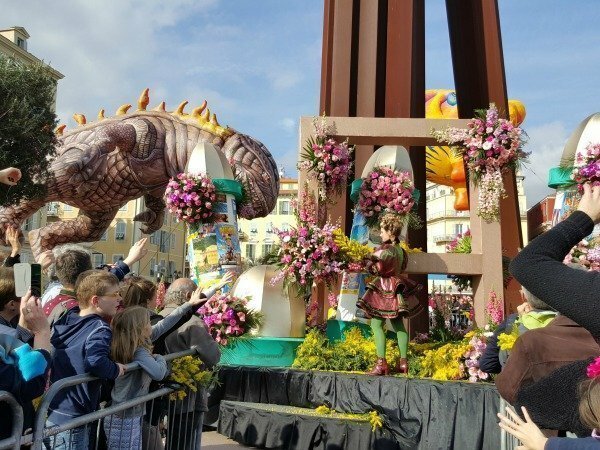 Do you like going to these sorts of traditional events? I’d love to hear from you. 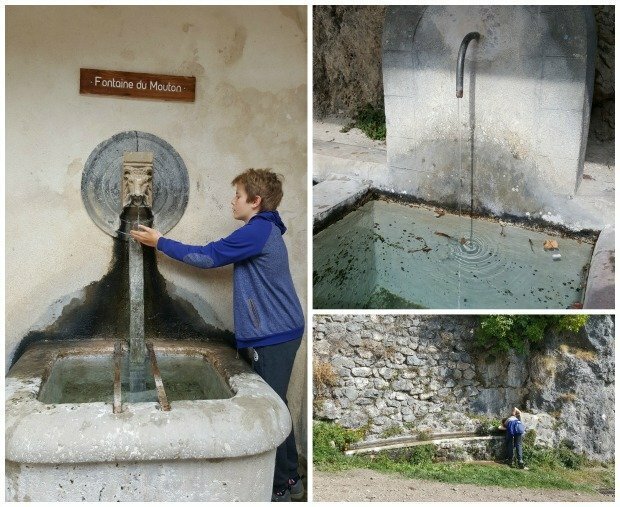 You might enjoy these related posts: 13 of the best hill villages near Nice and Autumn pumpkin fair. Thanks for linking up to #AnimalTales and if you have any more animal posts the Jan linky opens tomorrow! Stunning! I’m lost for words, this place looks so fabulous. I’ve always heard of the transhumance but I thought that the practice had died out with modern,more intensive farming. I guess not, and it’s great to see. 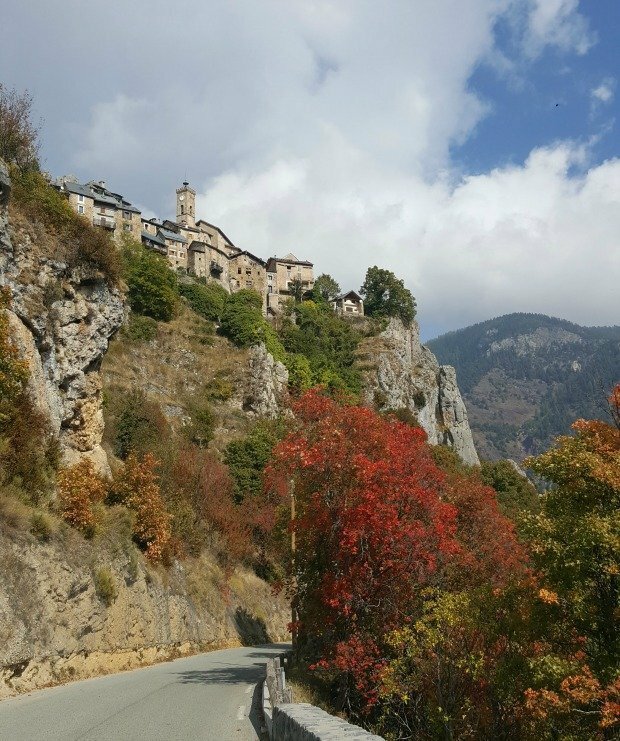 I can’t believe how pretty Roubion is, with its colourful paintings and incredibly steep streets, perched at it is on the edge of the cliff. A must-see! Those sheep are SO WELL BEHAVED. Trying to move ours is a nightmare but then we only have 5 ewes, a ram and 8 lambs and unfortunately Dotty Doreen is the leader and she never goes where she is supposed to and then everyone else follows her! It does however provide entertainment for our gite guests!! Great description and pics there, Phoebe. I’ve never been to one myself, maybe because I grew up in Wales surrounded by enough sheep to last me a lifetime. But I’ll never tire of villages like Roubion – that’s a lovely little chapel. 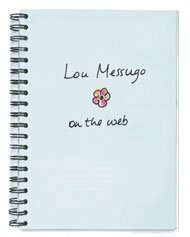 Phoebe – I loved reading this! Transhumance is also a major event in the mountains of the Cantal, where they organize buses to pick you up and take you back to your car park after a day of walking with the sheep. This is one of those aspects of French life that really reminds you of how things have been done for centuries — thanks for writing about it! I loved reading this. I remember learning about transhumance in geography lessons in school! 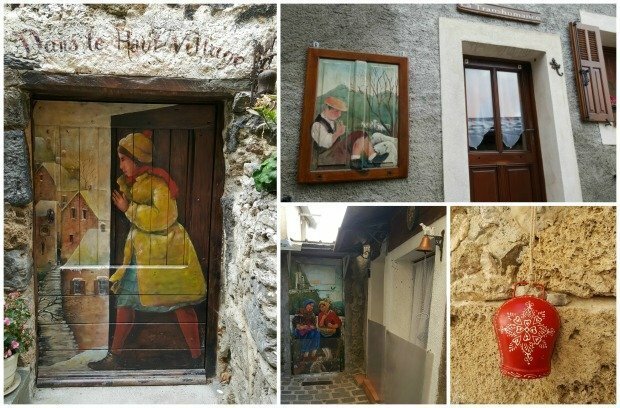 What a great experience for you and the family and how beautiful is that hill top town, especially with the little paintings. ps – we also got caught out with wonderful weather in Austria last month – up to our ears in merino wool and we needed T-shirts! OMG. I was born and raised in the area, although i have been in the USA for 21 years and now live in Phoenix AZ. Your post and video brought back many wonderful memories. Thank you for sharing! Such an interesting post and something I have yet to experience! Your post also made me think of Heidi which I haven’t read since I was a little girl. Funny what can be triggered in one’s dim & distant memory! Thank you! Oh my gosh, the cliffs are breathtaking. The fete looks like a good time! 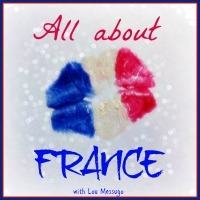 Thanks again for your hard work always hosting #allaboutfrance! Love the video with the sheep running through the village! Don’t they just smell like cheese??? Oh my boys would love this 😉 They love animals (and are obsessed with poo which seems to have them both giggling at any mention of it!) So with 2,000 sheep they would be in their element! We did a Transhumance when we lived in the south and it was one of the most magical things I have done. Your photos are stunning and brought all of the memories back to me. All those sheep! Not heard of this before but I guess that’s cause we’re not near the mountains. We don’t have a lot of sheep near us either, mainly cows, and I’m not sure I’d want a load of cows herding through the village! I love the painted doors. I’ve always wanted to see a real transhumance, we did see a mini one with goats in our local market town that had been set up, but we don’t live that close to the mountains. 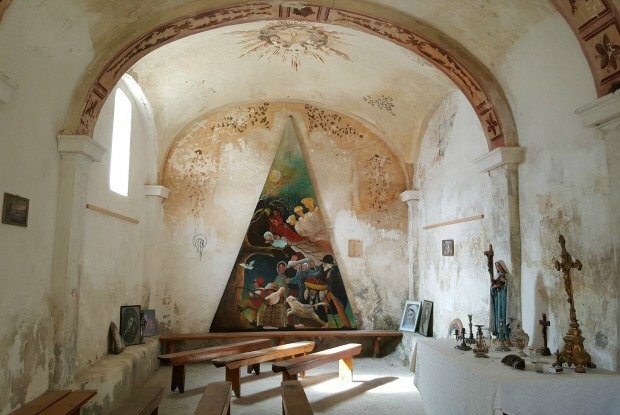 I loved that little chapel, I have a thing for painted frescos in tiny village churches, you never know when you are going to stumble on something fantastic. So glad you managed to squeeze this in on your ‘change over’ day – definitely worth the trip. Are the love hearts on the sheep painted? I guess this is not the usual symbol of the farmer but maybe used on this special occasion? Jolly hardy are shepherds and sheep! Love this Richard. I didn’t know that Urska, maybe there are even more countries who have a similar tradition also. But very obliging of the weather! Kids are always at these local festivities which I agree is really good to see. I do like attending these sort of events. And the change of scene sounds very welcome. Typical of the weather to be unexpectedly glorious though! That’s amazing and fascinating to hear Richard, thanks for sharing that. Thanks for sharing the names in Slovenian and Swiss languages, always interesting to hear that other countries have similar traditions. It really is wonderful, we’re very lucky! I’m not sure about a French equivalent, I must find out! It’s really cute Corinne, you’d love it! Phoebe, I have yet to do a Transhumance in France. I’ve done them in many of the other European countries. Roubion sounds like a fabulous one. What a cute town. 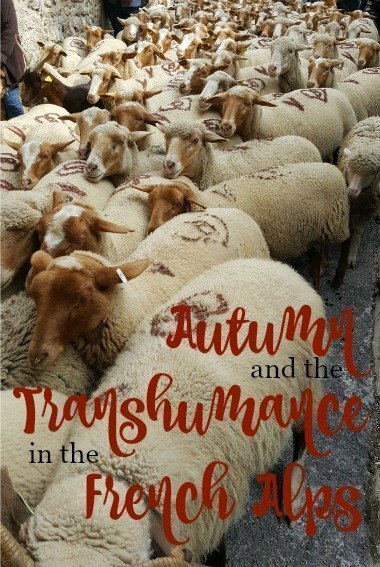 I’ve never heard of transhumance before but it looks like an amazing day out. 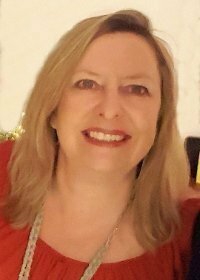 Glad to hear your husband now knows higgledy-piggledy, is there a French equivalent?! It was great fun Rin…hopefully one day you’ll come and see a transhumance with us. Yes it really is stunning in autumn (this year especially) and we really did have a great day out. I’ve heard it’s good in St Remy, but what I don’t understand is why it’s in June? Surely that’s rather late to move the sheep up to summer pastures. Great post! Transhumances had (maybe still have) interesting political connotations. Those for instance that crossed the Bulgarian-Greek border in the Rhodopes managed somehow to continue throughout the Cold War, despite barbed wire fences, checkpoints, armed guards, watchtowers etc. It took more than a mere Iron Curtain to stop those shepherds and their flocks. 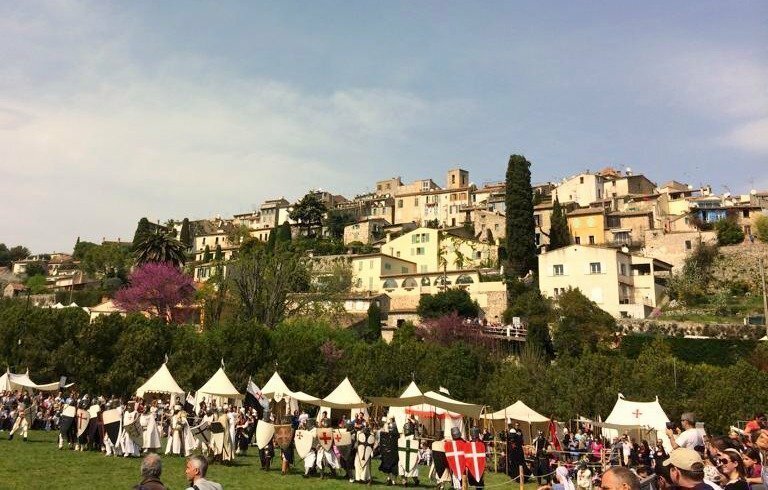 I went to see the transhumance at St Remy de Provence in June and it was brilliant. Thoroughly recommend people go if they are in the area as it’s a really unique experience. Oh, it looks beautiful there this time of year. What a gem! It looks like you had a great time.